Nature has developed ways of surviving in some of the most hostile climates on the planet. The desert fox or fennec (vulpes zerda) is perfectly adept to life in the desert. Its bright silver colour and the special structure of its coat allow it to reflect the heat of the desert sun. Radiated heat is reflected by the fox‘s thick coat, preventing its body from overheating. The X-BIONIC® Team of researchers have used the same principles in X-BIONIC® products and developed the new material xitanit™. 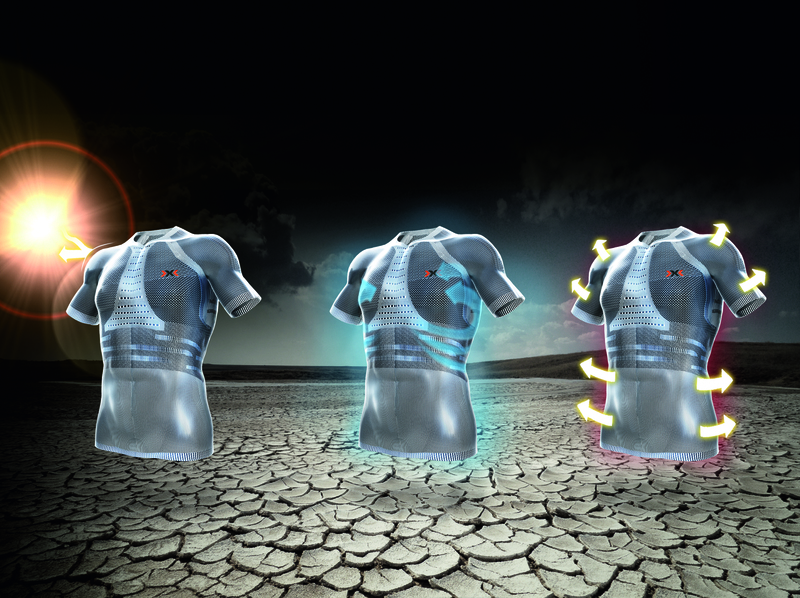 The unique xitanit™ fibre allows the outer surface of the shirt to reflect external radiant heat. Boiling hot sunshine, gleaming black asphalt and heated building facades are all environmental factors that can raise a runner’s temperature. This radiation is prevented from penetrating to the skin of the athlete and is reflected outwards. The effect is palpable; the jersey heats up on the outside but stays cool on the interior. The high degree of conductivity in xitanit™ conducts body warmth to the outside. A sweat disperser: The properties of xitanit™ and the knitting structure distribute perspiration over the whole surface of the body. As you sweat, the 3D-BionicSphere® System takes over and causes the moisture to evaporate. The process of evaporation reduces temperatures, creating a cooling effect. The result: less energy is spent keeping cool, even when indulging in strenuous physical exercise. Your energy and performance levels are maintained.